There was once a very rich man called Kish. Kish comes from the tribe of Benjamin. Kish had a handsome son called Saul. Saul was the most handsome and tallest man among the Israelites. Saul took a servant and departed to find the missing donkeys. They went into all the places including the hill country of Ephraim, Shalishah, as well as the territories of Shaalim and Benjamin but their donkeys were still nowhere to be seen. Finally Saul and the servant came to the place where the clan of Zuph lived. Saul and the servant went into the town where Samuel lived. As they were going up the hill, some women were coming out of the town to fetch water. Saul and the servant went into the town. As they were entering the town gate, Samuel was coming out. Saul said to Samuel, “We are looking for the prophet who can see vision”. Samuel took Saul into the dining room at the place of worship and seated him. He gave Saul the best portion of the meat. After Samuel and Saul had finished eating, Saul went up to the flat roof of Samuel’s home to sleep. 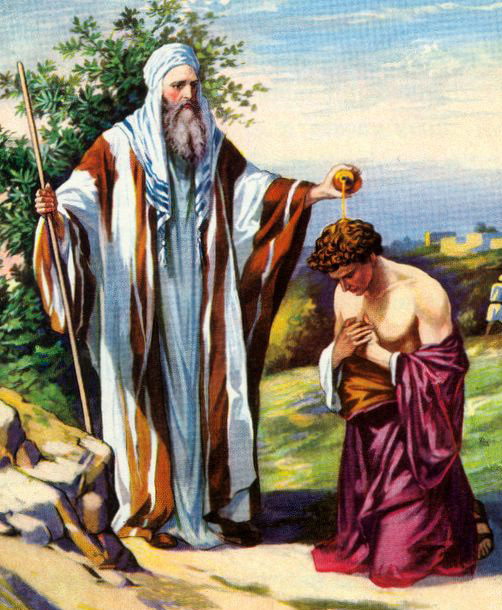 The next morning, Samuel took a jar of olive oil and anointed Saul. Samuel embraced Saul and said, “God had chosen you to be king over Israel. After you left me, you will meet with two men near the tomb of Rachel in Zelzah who will tell you that the donkeys had been found. Go from there to the giant oak tree at Tabor, You will see three young men. One of them is leading 3 goats, the other will be carrying 3 loaves of bread and the last one will be carrying a jar of wine. After you meet them, one of the men will give you 2 loaves of bread. Next, go to Gibeah and you will see the army camp of the Philistines. The prophets will meet with you as you enter the town. Then the Spirit of God will suddenly take control of you and you will prophesy along with them. Saul left Samuel and found everything happened just as Samuel told him. Samuel sent message to the Israelites to gather at Mizpah. Every tribe came forward to the altar and God chose the Benjamin tribe. After that, each clan of the Benjamin tribe went forward to the altar and the Matri clan was chosen. Then Saul the son of Kish is chosen to be king over Israel. The people ran and brought Saul from the baggage into the crowd. The people noticed that Saul is a handsome man and a head taller than them. The people cheered for Samuel as their new king and followed him. But some men mocked at Saul and didn’t give any gifts to Saul. Saul was very angry but he stayed calm.